I started logging the movies I watched in Letterboxd after IMDb broke the final straw. IMDb, the only website I’ve regularly visited for twenty years, had been getting more annoying for years anyway. 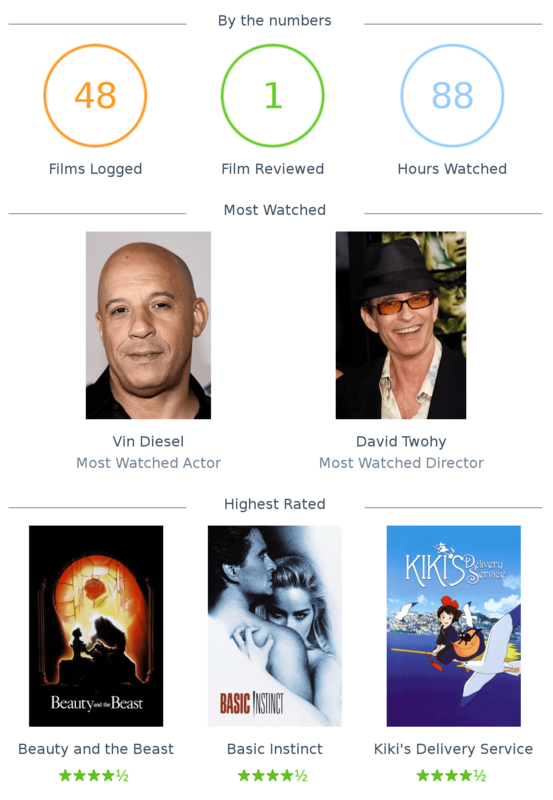 Letterboxd sent me a clever little overview e-mail in commemoration. Yep, I like Vin Diesel. Sue me. I have no idea why it opted for those three specifically when I gave Wonder Woman and Léon the same rating, plus I explicitly marked the Disney movie as a rewatch. Basic Instinct never appealed to me for whatever reason, but last year I found out that it was directed by Paul Verhoeven, one of my favorite directors. He didn’t disappoint.